There was plenty of takeaway for Liberty men’s Division I (DI) hockey team this Jan. 23-24 weekend, but no wins. The 11th-ranked Flames dropped a two-game home series to the 3rd-ranked Ohio University Bobcats, whose American Collegiate Hockey Association (ACHA)-topping defense propelled them to deliver the Flames first home sweep of the season. Preaching system execution and commitment to the playbook after a muddled Jan. 16 outing versus Rochester College, the Flames played an improved game but seemed to suffer from bad puck luck. After the Bobcats went up 2-0 early in the first period, Liberty responded with second-period goals from junior forward Bram Erickson (assisted by senior forward Lindsay LeBlanc and freshman forward Luke Hannon) and freshman forward Robert Ward (assisted by freshman defenseman Ben Hughes and freshman forward Grant Garvin). The even score lasted just minutes, as Ohio scored twice more — the first when a bad bounce from the puck caught freshman goalie Josh Halpenny off guard, the second a power-play goal snuck in while Hughes sat for a holding call. Ohio scored three more goals before the night was over, including one tipped off Halpenny’s glove and one in which freshman defenseman Peter Shantz’s stick broke in a one-on-one situation. Head Coach Kirk Handy also acknowledged bad breaks but declined to use them as excuses, instead noting areas with apparent room to tighten up play. For all intents and purposes, Liberty did just that — hitting the ice on Saturday night, Jan 24, with a verve perhaps lacking in recent weeks. A physical, fast-paced game from start to finish, the Flames battled to overtime, where Ohio ended it with a 3-2 win. Ohio once again struck first, scoring a late first period power play goal, but by the end of the second, junior forward Ryley Egan tied things up with help from Hughes and Garvin. 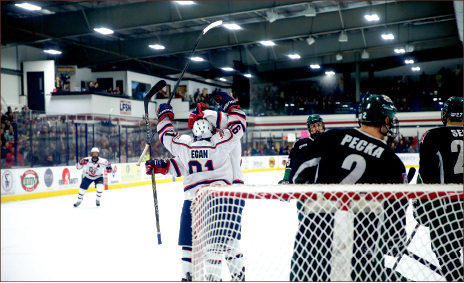 Things looked grim after the Bobcats found the back of the net once more in the third, but with under two minutes left in regulation play, Egan fired a shot with his offhand that snuck past the Ohio goalie to tie the game once more. His stroke of luck took the Flames to overtime, where both teams maintained the frenetic pace until the Bobcats ultimately fired the winner. While the end was disappointing, Handy and his players seemed encouraged by the means. The Flames will get that chance next weekend, Jan. 30 and 31, as they travel to Delaware University for a two-game series Friday and Saturday. RUSH is a sports reporter.